"How To Go From A Beginner Who Likes To Cook All The Way To Head Chef Of Your Favorite Restaurant!" Everyone likes good food. But not everyone can cook. In fact, it takes a lot of practice to learn to make tasty dishes over and over again. There are culinary schools all over the world. Many colleges teach the culinary arts. And don't forget the trade schools. With all these options, do you know where to start? Do you like to cook? If your answer is yes... if you want to learn to prepare a delicious entree for your friends, family, customers, or more importantly, yourself... then I have news for you. You can make delicious food for a living! Just by becoming a chef! I'm going to tell you everything you need to know to make this dream possible. From when to start, where to get training, all the way to which specialty is right for you. "...Chef... 1... 2... 3... !" Give me 25 minutes of your time and I'll send you on your way to a promising career as a head chef. Not everyone in life has the opportunity to "work" doing something they love. Most people have a choice between "9 to 5" jobs sitting at a desk or performing manual labor. Back breaking manual labor. But the people who make a conscious decision to do something they love - often achieve it. The difference is, they make the decision before the opportunity passes them by. Here is my promise to YOU. If you want to change your life for the better. Starting today. I can show you how. "...Who Else Wants To Live A Dream Life As A Master Chef?" The rest is up to you. I'll show you the way. But you must follow through! "How To Become A Chef" is my thoroughly researched, 50-page report that will teach you everything you need to know to get started with your career in the culinary arts. You can download my guide to your computer in minutes! 8 questions you need to ask yourself before deciding to become a chef. Find out how long you will be expected to "pay your dues" before being considered for head chef. The truth about trying to become certified through an online course. 5 things to research when looking for a culinary school that's right for you. Find out the one job you must take first if you ever want to run your own kitchen as a chef. Find out what you can expect to make in dollars as a Head Chef, Restaurant Cook, Short Order Cook, or Cafeteria Cook as you enter the work force. Discover the most prestigious specialty a chef can have - and what you need to know to get started. Understand what elements of business you'll need to brush up on if you plan to run your own kitchen. Realize the importance of people skills on the success of your career. Understand the working conditions you will be under as a chef - so you you'll know if you make a great fit before you start your journey. Find out what the word "sous" means in the kitchen - your job may depend on it. Discover the endless freedom that being an experienced chef can provide. Find out the rewards of working as a personal chef for families. Learn what being a gourmet chef really means, and what you'll need to learn in order to take this job. Why becoming a chef involves a whole lot more then just learning to cook - do you have what it takes? Learn what makes being a chef a very physical profession - and great for people who don't like to sit behind a desk. Find out which training will put money in your pocket as you learn more and more in the kitchen. 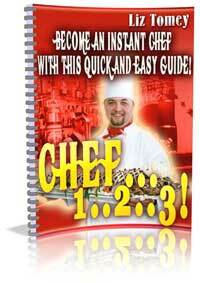 Discover what you will need to be a great chef and live a rewarding life doing so. 10 of the best culinary schools in the state - and information on how to learn more about them. 7 of the best books you should invest in if you want to have a future as a chef. 8 web sites you should visit today to further explore this field. "Are You Ready To Start Your Adventure As A Master Chef - Your Dream Job?" ...is that you get to eat the delicious food you cook! But the best thing about being a chef, is you get to achieve something that most people never do. Working in a job that you truly love. Believe me, you'll never get bored when running your own kitchen. The action is always going in a fast-paced, team-oriented environment. The minutes on the clock don't slowly tick by like at other jobs. That's for sure. Instead you'll be taking your lunch break before you even realized any time had past. You'll be too busy working your passion to notice. That's the way life should be. And is for the select few who make the decision to move forward with their dreams and goals. If you're about to make the decision to change your life for the better, I applaud you. But I am also here to save you the hassle and potentially thousands of dollars you could waste if you took this adventure alone. I've put over 30 pages worth of valuable information together to help you decide what route to take when pursuing your dream job. Even the information you'll need to decide if this job is right for you in the first place.